In 1963, Richard Hofstadter published his landmark book Anti-Intellectualism in American Life. 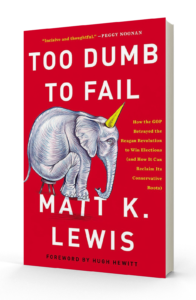 Today, Matt Lewis argues, America’s inclination toward simplicity and stupidity is stronger than ever, and its greatest victim is the Republican Party. Lewis, a respected conservative columnist, eviscerates the phenomenon of candidates with a “no experience required” mentality and tea party “patriots” who possess bluster but few core beliefs. Lewis traces the conservative movement’s roots, from Edmund Burke to William F. Buckley, and from Goldwater’s loss to Reagan’s landslide victory. He highlights visionary thinkers who understood nuance and deep ideology and changed the course of the nation. Lewis has an urgent message for fellow conservatives: embrace wisdom, humility, qualifications, and inclusion–or face extinction. Matt K. Lewis is a Senior Columnist at The Daily Beast, a news and opinion website focused on politics and pop culture.